Every health insurance company in Massachusetts must comply with the law. 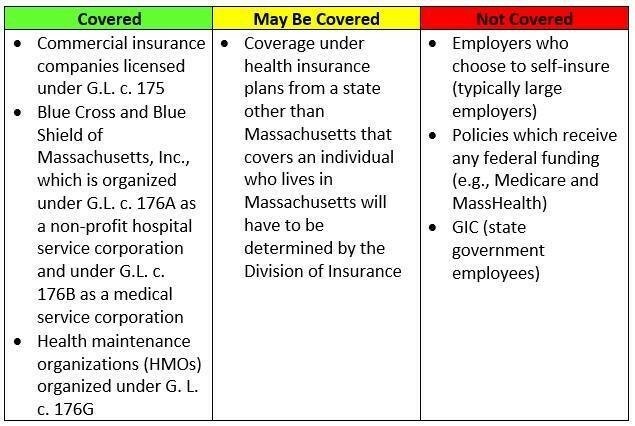 The exceptions are large employers who self-insure (who are subject to federal rather than state laws), MassHealth, GIC (state government employees), federal policies like Medicare, and other policies which receive federal funds. Insurance companies that are based out of state may be subject to review by the Massachusetts Division of Insurance. Clarification about out of state health insurance plans from one of our bill sponsors' offices: "Coverage under health insurance plans from a state other than the Commonwealth that covers an individual who is lives in the Commonwealth will have to be determined by The Division of Insurance, as they are the agency responsible for administering and enforcing Chapter 175 of the General Laws, and therefore would be responsible for interpreting the language and determining which plans would be subject to the mandate. If the agency interpretation is disputed a court ultimately may be asked to determine what the phrase means. If this is the case it would probably be best that the individual be referred either to the Division of Insurance or to the constituent’s or her employer’s private legal counsel."